Portoferraio was built in 1548 on the ruins of Fabricia, which was the ancient Roman name for the town. With a population of 12,007, Portoferraio is the most densely populated town on Elba and is the gateway for cheap flights to domestic and international destinations. The ferry companies that work from Portoferraio are Toremar Ferries, Moby Lines and Corsica Sardinia ferries. The island Montecristo belongs to the municipality of Portoferraio. Much of the island's fame is derived from the fact that it provides the setting for part of the novel The Count of Monte Cristo, by Alexandre Dumas. The story of The Count of Monte Cristo takes place in France, Italy, and islands in the Mediterranean during the historical events of 1815–1839: the era of the Bourbon Restoration through the reign of Louis-Philippe of France. Dumas arrived on the island in 1842, in the company of Napoleon Bonaparte's nephew. "It is fantastic and lonely, smelling of thyme and broom," he wrote, in a letter. He decided to write The Count of Monte Cristo to remind him of the trip. His hero, Edmond Dantes, discovers a pirate's treasure on the island after being tipped off by his companion in prison, Abbé Faria. According to a legend, a treasure was hidden in Portoferraio. 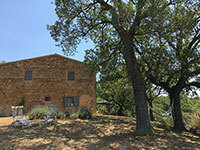 Podere Santa Pia is a beautiful stone farmhouse only 2 km away from Castiglioncello Bandini. The main house is spacious, comfortable and well furnished and offers its guests a breathtaking view over the Maremma hills. It is the ideal location for those who wish to enjoy total privacy. Waking up at dawn to start hiking, learning once again the names of flowers and trees, and above all, having the pleasure of getting lost, forgetting about guides, clocks and timetables. Podere Santa Pia overlooks a valley characterised by all the elements of the Tuscan landscape. 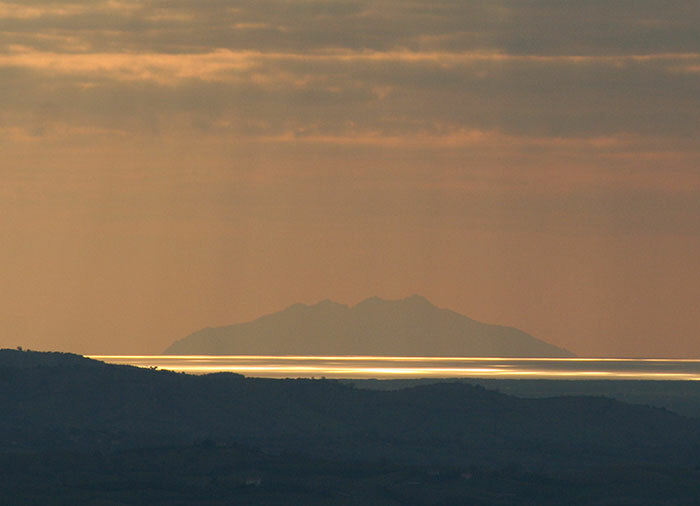 On a clear day you can see as far asElba and the little isle of Montecristo to the south. Alexandre Dumas visited the uninhabited island of Montecristo in 1842 and was inspired to use the craggy, windswept rock as the setting for his novel The Count Of Monte Cristo. Photo byGian77. This file is licensed under the Creative Commons Attribution-Share Alike 3.0 Unported license.